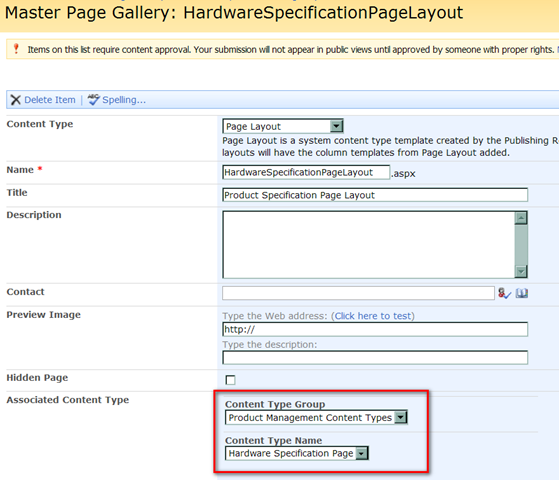 Changing the Content Type on a SharePoint Page Layout | Are you a user? Here’s the situation. You created a content type and a page layout based on that content type and then discover that you need to redefine content types. In fact, you find that you should have created a parent content type and had other content types inherit from it. After reworking your content types and site columns you now want to change your page layout so it references the correct content type. You can do this by visiting the Master Page Gallery in SharePoint and changing the Content Type Name on the properties page. If you were looking for a place to do this in SharePoint Designer, I haven’t found it. Now, when you go back to edit the page layout in SharePoint Designer, you won’t get all those nasty errors informing you that it can’t find the Page and Content fields because it can’t find the content type.